Industrial innovators Voivod have been blasting out their powerful brand of noise for over 35 years. Despite this, I have never had the opportunity to witness them live. This was to change recently when a rare opportunity was presented to me as they toured the UK to promote their latest album “The Wake”. After initially scheduling an interview with original drummer, Away, this was suddenly changed minutes before I met the band following their Manchester soundcheck. These things don’t generally tend to phase me, however, and I then relished the opportunity to chat instead to singer Snake – bit of a bonus as he rarely does any interviews). ANTIHERO: Firstly, I want to thank you for stepping in last minute to do this interview with me. I understand that you don’t do many interviews? Snake: That’s all right. We started upon the UK leg in Southampton at the beginning of the week, on Tuesday. It’s been great so far. ANTIHERO: Do you play the UK often? I don’t recall seeing many Voivod UK tours advertised much over the years? Snake: We should have been playing much more than we did, but as we go, every time there’s more shows. Every time we go on here, so it’s catching up. ANTIHERO: Latest album has grown quite popular. It’s achieved some great chart positions internationally. Do chart positions interest you or not these days? Snake: Yeah. Definitely. We keep tracking what’s going on. I mean, it’s been two weeks since this album, a lot of excitement, a lot of good reviews, good response. And it’s thrilling to see the reaction, actually, we are going on the charts. I think we are number 26 in Germany and stuff like that. ANTIHERO: One of those chart positions was quite interesting. Number 8: America, New Artist. ANTIHERO: Exactly. Only after 30+ years. Snake: Yeah, 35 years later. It’s kind of an odd phase. Doesn’t mean that we are new for anybody, but it’s a good sign that the album is actually catching the interest of the people. ANTIHERO: What about your standing in different countries? Do you find that you can play big venues in some places, and not so big in others? Is it just sort of variant depending on what country that you are in? Snake: I think venues are venues. There are really crappy venues, but they’re famous places; everybody played there. It has a reputation; it has a trend to it, even if the walls are crumbling down. Snake: It’s the history that goes with it that’s interesting. Of course, you know, there are cool venues with good equipment and it sounds good and it’s really fun. ANTIHERO: How can you explain how you’re still here over 35 years later? Do you have a secret? Snake: No. I think, actually, it’s for the love of it. To think that we could have pulled the plug so many times. I think it is a matter of keeping the name of Voivod alive even if Piggy died in 2005. ANTIHERO: That must have been a difficult sort of crossroads for both you and Away. Do we go on, do we not go on? Snake: It was a long mourning after he passed away, but the best way we could do, in order to honour him was to keep going. We did everything we could to do so. I’m glad we did because Piggy’s music’s still out there; it’s been played. People can actually hear it. ANTIHERO: Part of a lasting legacy? Snake: Some of the new people, who never saw Piggy live, at least they can relate to the guy himself and we are still doing what we love to do and that’s fantastic, I think because many bands, sometimes stuff happen to bands; you lose an important member or different stuff that could happen that’s going to change the destiny of a band. So far so good. We have ups and down; it was like a roller coaster all our career. But we managed to do the best we can to keep on going. ANTIHERO: How would you describe the band to somebody who has never heard of you? I mean you’re very hard to, categorise – Voivod can’t easily be put in a particular box. Snake: It is very hard to put in a box. I think it’s a mixture of different things that we grew up with. It’s a mixture of Prog music combined with different, for instance, metal, punk, rock in general. 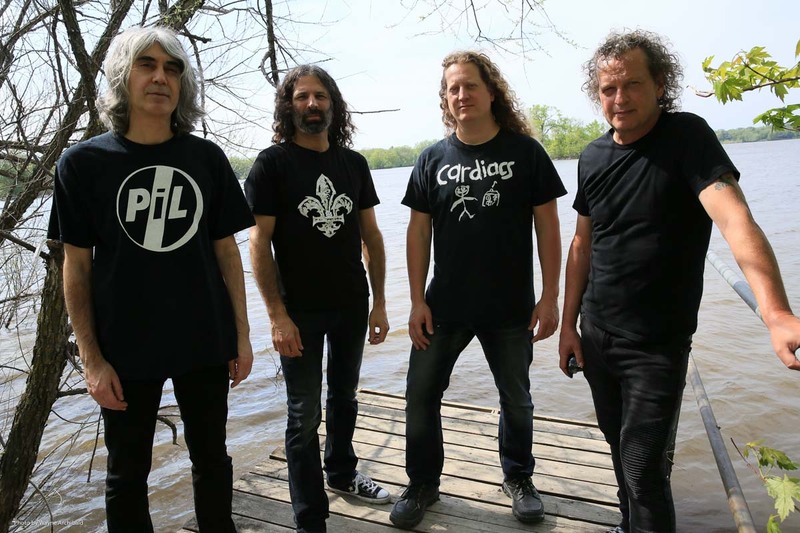 ANTIHERO: Do you find that as you get older that you bring more things into what you’re doing, as you get to hear more music and absorb more influences and nuances into what is Voivod. Thus the band itself changes and evolves. ANTIHERO: With maturity comes progression I guess. Obviously, when you first started there was more of a sort of thrash metal style. As you said, it’s different now. Snake: But it’s always the edge. It could be Prague, but it could be trash bonk in some places. It’s a different crossover that we have, but I think we are kind of unique without genre. ANTIHERO: Stand alone. There is nobody that sounds like Voivod, really. Snake: As you said, it’s hard to put in a box. ANTIHERO: Obviously the music industry has changed a hell of a lot since you guys first started. There is less rhinestone record labels and the whole financial side of things has changed. Is it more difficult these days to keep going, to survive and even keep a roof over your heads? Snake: Yeah, it is difficult, I’d have to admit. But as long as there are people who would go out and go to shows and buy tickets, I think we can keep going. Of course, it is a different picture than it was. ANTIHERO: You don’t have the income of the albums as much. Snake: Yeah, but we always try to sort of make our way through these exchanges. You can’t stop it; it’s like trying to stop the wind with your hand. ANTIHERO: You have got to embrace it. Snake: And look at it differently. This new album, The Wake, I think, we wanted to do a conceptual album. We wanted to give some sort of love for the people to buy a record, physically. I think we quite succeed for that. It’s been out only two weeks, but the reaction’s so great that I can tell people will buy the record. Sometimes they are waiting, they’re not going to go on Spotify or anything. They are just waiting for their copy to arrive at home. ANTIHERO: It’s nice to have the vinyl. Snake: So, there is something the vinyl brings it back a little bit to have physical possession of a record. ANTIHERO: I still miss the record shops and the vinyl format. Sad that that has nearly completely died out. Snake: To have a piece of a collection or something that you can play it and because it’s a conceptual album. I remember when I was a kid, really young, I discovered Sergeant Pepper. It was the first conceptual album. ANTIHERO: Or Pink Floyd? That band was always an influence with Voivod. Snake: Yeah, Pink Floyd, Dark Side of the Moon and stuff like that. It reminds me of those records. Of course, it’s different today. There’s no doubt about it, but we keep going. ANTIHERO: Do you play much of the new album in the set? Snake: We play three songs actually from the new album. ANTIHERO: It must be difficult even before you go out on tour. Trying to get a setlist together What songs are you going to doing this time because you have a massive back catalogue – after 35+years there is a heck of a lot of music that you can perform. Snake: It is really hard to do a song list, but we, I don’t want to spoil it, but this time around we decided to take some songs that have not been played for ages. And the reaction is really good because we are not really. ANTIHERO: You’ve been in the band with your drumming partner for many, many years. Do you still argue? Do you just know each other instinctively, what you’re thinking? How would you describe that relationship? Snake: Well, Michel and I have been a long relationship. We’ve known each other since school, kind of put this band together. We went through good times and really difficult times. I think it’s like we are like old brothers, or something like that, a good team. Even the youngbloods, the newcomers in the band, we see them as, okay it’s a different Voivod version, but they are really “Voivod-ian”. ANTIHERO: It keeps you guys fresh. That injection of young blood and personalities. Snake: Those guys actually grew up with the band and like to play with the band. ANTIHERO: It must be nice to let those guys share that. Is it easier or more difficult to create music as you go on? You want to avoid repeating what you’ve done before and yet, trying to come up with something different? Has each album presented a real challenge? Snake: Yeah, it is quite a big task each time, but, I mean, we don’t force it. We just let ourselves go and instinctively we know if it fits with Voivod music or not. We have this kind of vision of what could be a Voivod song and Chewy comes with a lot of good ideas. Everybody put everything in it, but the contribution of Chewy, and Rocky, and me and Michel, together; it’s a fantastic chemistry right now. The lineup is just perfect. We are really good at creation. We are really good at putting the band on the road and keep going. So I think the vibe right now is really positive and I hope it is going to stay like that until the end. It’s not difficult. I wouldn’t say it is difficult, it just takes time, it takes effort, but it’s not difficult to let yourself go and create. ANTIHERO: Just a couple to finish. Do you have personal career goals, hopes, and dreams that keep you going or have you checked all those boxes a long time ago? Snake: It’s hard to say. At my age, I just want to be happy. Snake: We all have all kind of little goals in life. But for me just not having much trouble, keep going, be happy, and be out there with people, and traveling and everything. I think it’s really nourishing my brain. ANTIHERO: Do you like, before you a show, do you like going out, checking out places, history, experiencing some of that culture, when you go to different places? Snake: Sometimes when I do have times, too bad my knees are really fucked. So, I can walk, but yeah, slower. I’m the last of the pack. ANTIHERO: Just a couple to finish. Do you still listen to new bands? Any new bands that sort of have come along recently that you’ve discovered? Do you still keep in touch with current music and new bands and artists? Snake: Some I really like that I’ve been touring with and wow, man, I’ve discovered a band. This band is good – Child Bite. ANTIHERO: I’ve found that even I can discover new artists. Snake: Old classic is always that but it’s fun to see that the scene is still happening and still going. It has to. It has to move on. Actually, there are bands that disappear like Motorhead; they’re no longer here. It’s a big hole to fill. It’s encouraging to see that there are people out there. ANTIHERO: It’s important that the next generation continues to keep the music alive. Thanks again for chatting to me ahead of tonight’s show. Snake: Great to chat to you Mark, it’s been fun.